This black Rosary cross is a one-of-a-kind. It's 18 inches long and made with Black Jasper, Black Howlite, and Jet Black Austrian Crystals. This black lava rosary ends in a skull. It's made by King Baby Studio. It's intriguing that this vintage rosary is named "Agony." It includes etched black rose petal wood and sterling. The "Eternally Haute" rosary reminds me of my favorite late 1980s goth clubs. 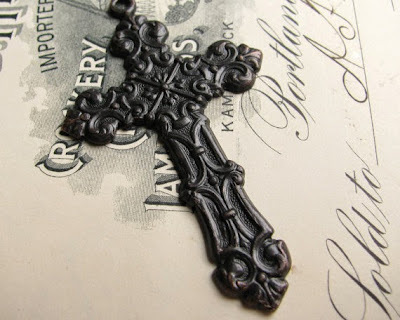 Here's a gorgeous, simple, classic reproduction of a Victorian mourning cross. Check out the other lovely jewelry items from the Etsy seller, Fallen Angel Brass.